The Angeln Saddleback pig is also known as the Angler Sattelschwein. The Angeln Saddleback pig is a rare breed of domestic pig which is grown mainly in Schleswig-Holstein, Germany. It is a large, lop-eared, black pig with a white band around its body which continues down to its forefeet. 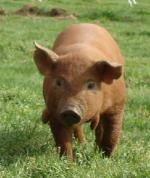 Typical sizes are 350 kg weight, 92 cm height (boars) and 300 kg weight, 84 cm height (sows). The sows are highly fertile with much milk. 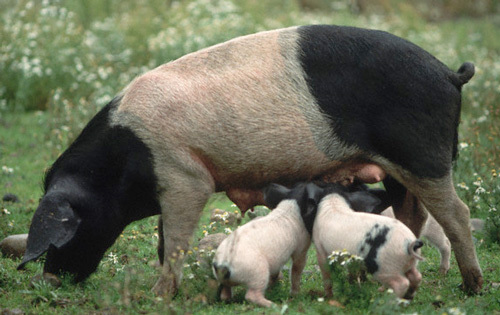 The Angeln Saddleback pig was crossed with a black and white Landrace pig with a Wessex Saddleback pig and originated in Angeln, Germany. It was accepted as a new breed of pig in 1937. By the 1950's it commanded a substantial local market share. However, in recent years, it has become nearly extinct as market sentiment has turned against its fatty meat.